Of Sauble Beach and formerly of Guelph, passed away suddenly at Grey Bruce Health Sciences Owen Sound on Tuesday, August 11, 2015 at the age of 83 years young. Betty was born July 21, 1932 in Kitchener, Ontario, the daughter of Reuben (1988) and Martha (Becker 1989). Predeceased by her husband Jim (2000); and her brothers Ken and Roy Eckstein. Beloved and devoted mother of Rob of Windsor, Allison Groff and Mark Rogers of Sauble Beach and cherished 'Grammy' to James Groff-Rogers. Sister-in-law to Doreen Groff, and Dorothy Hallman, both of Kitchener. She will be missed by her faithful dog and walking companion Connor. In 1954, Betty married the love of her life H. James Groff and lived for many years in Guelph. Her career at Kaya's in Kitchener began her lifelong love for fabrics and sewing which she still worked on through her handmade jammies for her grandson. Her devotion as a mother could be seen through the many handmade articles. Her career then moved to the Nursing School in Guelph as Assistant to the Director, and for many years the Medical Receptionist at a doctor’s office. She was a former member of St. Paul’s Lutheran Church in Guelph, where she belonged to the Choir, music being another of her passions. Betty was the organist for many years at Christ the King Lutheran Chapel Sauble Beach and later at St. Peter's Lutheran Church Wiarton. After Jim's passing she began to write poems and stories for many occasions. One of her greatest loves was her grandson James. Being his 'Grammy' was her number one passion. Their many adventures together were the inspiration for her book 'The 3 R's - Read Rap and Rhyme with Grammy'. This was in addition to her many published poetic writings and articles. She embraced retirement at the Beach and was active in the Book Club at Sauble Beach, The Sauble Sandpipers, and Sewing for Cancer Quilts. Betty was also a very active Volunteer in her community always willing to lend a hand to a cause and to help those in need. Betty enjoyed all of nature and especially sketching and painting those scenes. 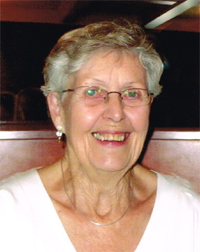 Betty was a member of Faith Lutheran Church, Port Elgin. Family invite friends to gather with them at the Thomas C. Whitcroft Peninsula Chapel, 272 Berford St., Wiarton (519) 534-5341 for a casual visitation on Friday August 14 from 7-9 PM. A service to celebrate Betty’s life will be conducted on Saturday at 11 o’clock from Faith Lutheran Church, 525 Ivings Dr, Port Elgin. Interment in First Mennonite Church Cemetery, Kitchener, on Monday August 17, 2015 at 1 o’clock. Donations to the Canadian Cancer Society, GBHS Foundation or BPHS Foundation would be appreciated.